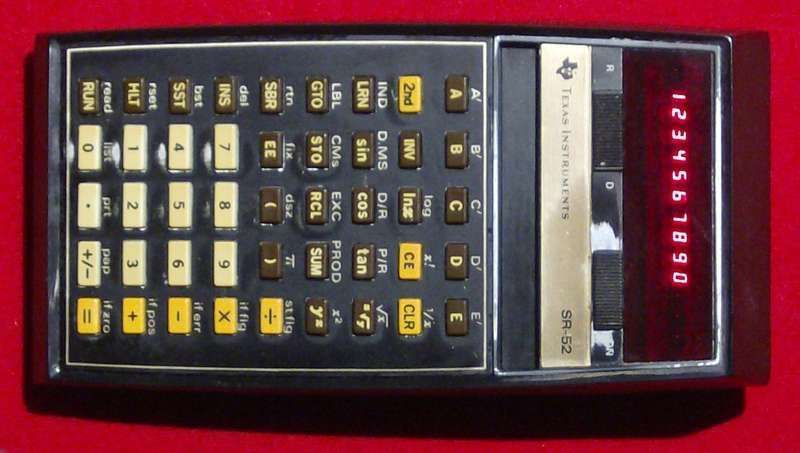 Texas Instruments SR-52, an easy-to-operate programmable calculator with extraordinary power and magnetic cards reader. Introduced in 1975 at the price of $375 or DM1200. Now mathematical programming is accessible to any professional. Problems that couldn’t be done without waiting to get on a computer are easily handled on an SR-52 weighing little more than 12 ounces. Complex repetitive problems or lengthy calculations that once took hours can now be solved in seconds. And the chances of error are dramatically reduced. The SR-52 is actually three calculators in one with three separate modes: Run mode. Calculate mode. Learn mode. With a few keystrokes, the run mode allows you to solve complex problems with programs from prerecorded magnetic cards quickly. The calculate mode lets you use the SR-52 as a powerful calculator to solve problems manually. And with the learning mode, you can literally teach the SR-52 your unique calculating methods. All modes can use nine levels of parentheses. 20 independent memory registers and 224 program locations. Combine this powerful capability with prerecorded programs, or programs you originate yourself, and you have an extremely valuable computational resource right at your ﬁngertips. programs from the Basic Library. Or one that you have written. Load the prerecorded magnetic card. This lets the SR-52 read the card’s contents into program memory. Insert the card above the user-defined keys. Enter known quantities directly into the program. Or into one or more of the 20 addressable memory registers. Or both. Execution is completely automatic. A program runs until it encounters a halt. Repeat a program as often as needed. Change values of your known quantities. Solve for different unknowns. The stored program is unaffected. The calculate, or manual mode is the foundation of the SR-52’s programming ease and efﬁciency. You also use this mode to begin building your own programs. As you work with an SR-52 you will probably discover new dimensions of its ﬂexibility and power-perhaps far more than you initially expected. Simply key-in your problem left-to-right as you would in the calculate mode. You can construct a program of up to 224 steps (000 to 223) and store it in the program memory. put to work immediately. Three diagnostic cards let you check for programming accuracy. A head cleaner to remove oxides and foreign particles from the magnetic read/write head. 20 blank magnetic cards let you develop your own programs. A carrying case for preprogrammed and prerecorded cards. A 50-sheet tablet of User Instructions and Coding Forms makes your own special programs easy to build. An AC adapter/charger to use while operating or for fast battery recharge from 115/220V wall outlet. And a sturdy vinyl cushioned carrying case with pockets for the Operating Guide and program card case.